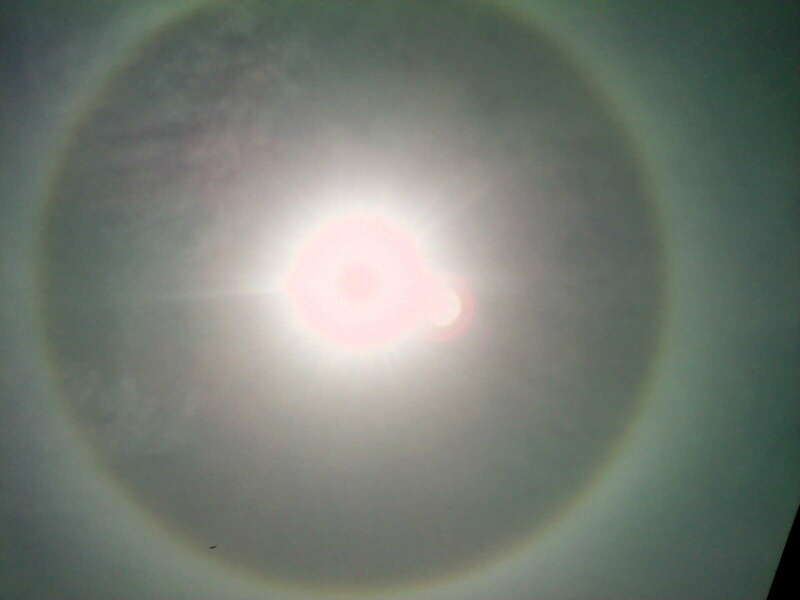 This morning I saw a halo around the sun as it was waking up. It was beautiful. I've been on a hunt to see the different Atmospheric Optics in the sky. 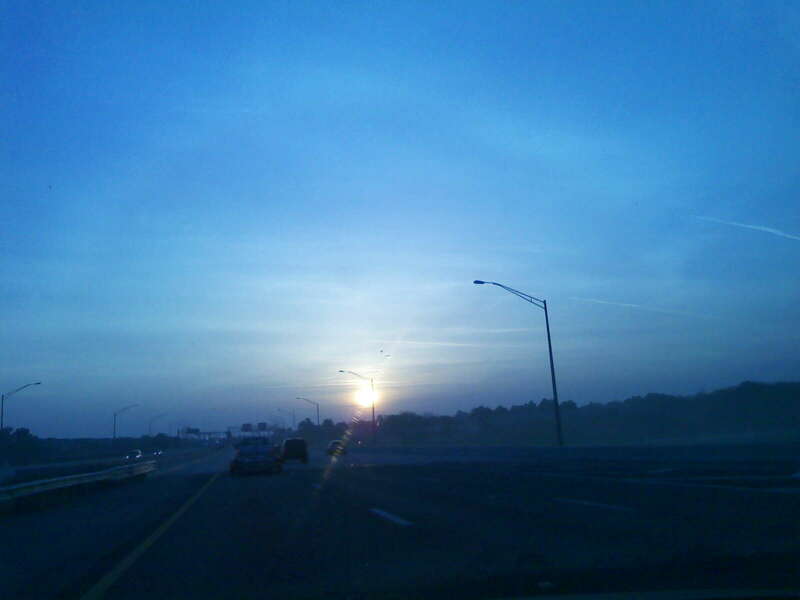 Here is a web site that shows you different Halos According to this site I may see a sun dog later today around sun set. As long as the clouds cooperate. We will see. This halo looks like an eyeball. I needed a wider camera. It was difficult to take this photo because I couldn't look in the camera to take the pic because I would be looking at the sun. 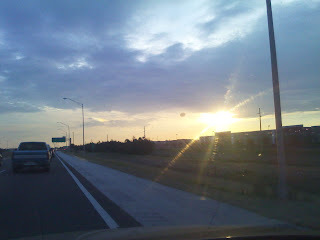 I think I am addicted to looking at the sun now. Well not directly at the sun, I think you know what I mean. I wonder if I could knit one of these pic of the sun? :) Have fun looking. Well we all know Cheryle won one wallet. Here are the other winners. Yes I said other winners. I did the random.org random number generator and it was so much fun that I wanted to see what other number would pop up. It was exciting so I did it again. And I did it again. I picked three numbers. I was going to do it again then realized I am already making 4 wallets to give away, so I should keep it at that. Without further ado The winners are in the order of random.org Two Cables and a Frapp!!!!!! Tas!!!!!! and Squiggi!!!! I will be in contact with them. Congrats to the winners and thank you everyone for reading my blog. I've also had the chance to read your blogs and I'm glad to find new blogs to read. Thanks!!!! Last night I was at work and they were training new girls for the show that I am in. I was a Tech and had some down time to just sit as the girls rehearsed. So I took this opportunity to knit. I almost finished the daisy cozy. I can't wait to make me a daisy cozy. It was a nice break from the other project I've been working on since Feb. 16th. I will post a pic of it in Ravelry if anyone is interested in seeing it. Other wise I will post it when I am finished with it. 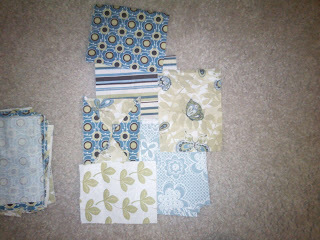 I also have fabric choices for the wallets here. The other wallet you can see the different colors I can do. I can do just one color or two or all. It is up to the winners. 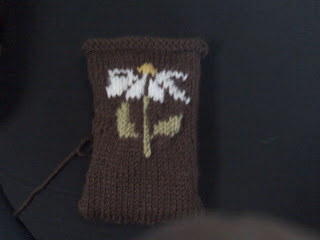 Here is another cell phone cozy for my friend Carolyn. It is going to have a daisy on it. I needed a small break from another project I am making. I hope to have enough yarn left over to make me one. I love daisies!! This is a cell phone cozy I made for Eli's wife. 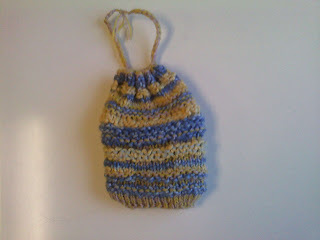 It is made from the yarn that I used to weave her bag . My 100th post contest is over tonight at midnight. Don't forget to post a comment in the 100th Post and Contest post. Good luck everyone!! If you look to the left you can see a sun dog. I just learned how to find them. If you Wikipedia Sun dog it will explain it better than I can. I look for them every day. Don't forget about my contest. It is over tomorrow. Good luck. It is finally here!! My 100th post. I was also tagged by my friend Joan. She has a blog called Anythingfitsanakedman. So this post I will list 7 things you may not know about me and have a contest. 1. My favorite candy in the entire world is Twizzlers. Barry knows I prefer Twizzlers over flowers any day! 2. I love strong, rich coffee!! Yum!! I have even dunked my Twizzlers in my coffee!! 3. One day I hope Tom gets Jerry, after all these years of Jerry aggravating Tom, Tom deserves some sweet revenge. 4. I know how to play the Clarinet. It has been awhile but I could play the heck out of "We got the Beat" by the Go Go's. 5. I know how to play the piano. Back in the day I could play really well. Now I'm a little rusty. 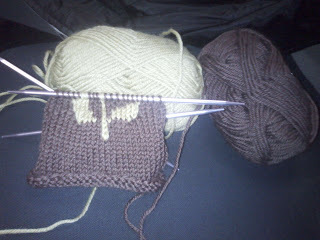 I spend most of my time now, knitting. 6. I use to write poems at least once a day. I am having a difficult time finding one poem I like the best, so I will post one on my next post. 7. My favorite game to play is Indian Ball. Somewhere in my 100 blog post, I post about my friend Joan. The first person to leave a comment in this post telling me what I made her and what colors it is will win a prize. I will also be giving away 1 other prize to a random commenter in this post as well. The deadline for this contest is Midnight March 22nd. The prize will be one of my magic wallets I was going to make for my family for Christmas. It will jump start me back on that project to get them done. You can pick out the color combination's if you would like. Good luck everyone!! !